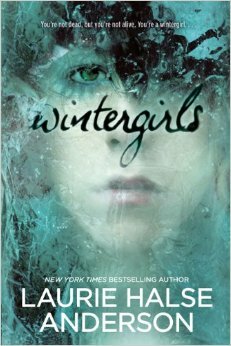 In the dramatic, but sadly realistic book Wintergirls, Laurie Halse Anderson tells the story of Lia, an anorexic teenager, after her closest friend Cassie mysteriously dies in a motel room. This engrossing book is suspenseful and breath-taking as Lia and her family take on many challenges and obstacles. More specifically, Wintergirls deals with real world problems such as children actually not eating and cutting themselves because they believe it cures their pain when they don’t even feel safe in their own bodies. This story of the challenges and responses in young teeenagers provides a frequently disturbing but important look into these real-life challenges that kids may go through. I found this story to be extremely sad and a bit disturbing, and because of some particularly uncomfortable parts I would only recommend it to young adults or very mature readers. In Wintergirls, Lia, is highly self destructive which is probably because her parents are divorced and her friend Cassie has recently died, these are both very hard experiences for anyone, and certainly for a young teenager as well. Consequently, this has pushed her to be the skinniest girl in the class, which can be seen as a consistent problem for her. Also, Lia spends most of her time in her house or driving her sister Emma to sports. The author, Laurie Halse Anderson describes what Lia is seeing and feeling physically and mentally, which provides a very good sense of the challenging feelings she is facing. Overall, I enjoy the writing style of Wintergirls and how the story is told through Lia’s perspective, however, it would be interesting if the story was told through multiple characters perspectives because then the readers would know more about the characters and it might change the reader’s thoughts on the story. For example, in some parts of the book, it shows hints of how different characters are feeling, and it would be interesting to know exactly what they are thinking as well. The same theme of teenage challenges and depression is shown in Wendelin Van Draanen’s book, The Running Dream. However in this book Jessica is not self destructive because she has just lost her leg, instead she is depressed because of the tragedy that has recently occurred and hurt her physically and mentally. Both of these girls have had something tragic happen to them, this impacts their life in similar, yet different ways. Wintergirls does not connect with me personally because I do not know anyone so self-destructive. However, I know someone who used to work with troubled children and she has seen many kids who have cut themselves and other awful things. On another level, Wintergirls reminds me of The Fault in our Stars, by John Green because the main character, Hazel, has lung cancer and is depressed similarly to Lia. However these two books are also different because Hazel knows that she is sick and that she cannot do anything about it, while Lia is focused on herself and just wants to get skinnier and skinnier in what seems a exceedingly self-destructive way. Something else about Lia’s condition is that it is never just Lia who is affected, her family is also affected, including her sister, her friends, her school, her teachers, and even her doctors. Wintergirls is absolutely a favorite and the messages will stick with me forever. It showed me the struggle of a struggling girl and her journey to getting better, and helped me appreciate how hard it can be for some teenagers and families to cope with tragedies and in Lia’s case, depression. Also it showed me how hard it can be to get better from something as complicated and tragic as Lia’s depression.